Does This Photo Show Nancy Pelosi Posing as 'Miss Lube Rack 1955'? - Truth or Fiction? Does This Photo Show Nancy Pelosi Posing as ‘Miss Lube Rack 1955’? A photograph purporting to show the lawmaker long before her political career ever began has been mislabeled. 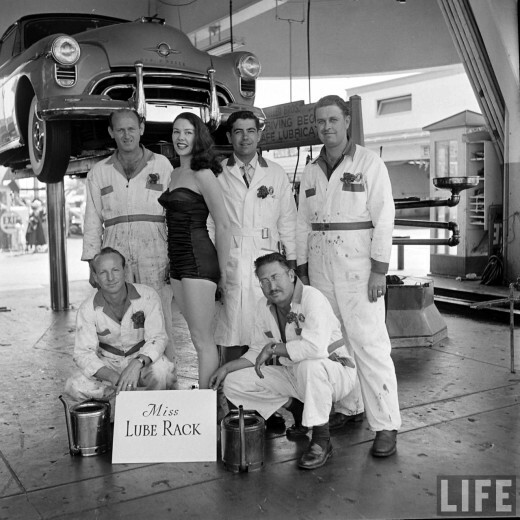 Long before she was in politics, Nancy D'Alesandro Pelosi posed as "Miss Lube Rack 1955." 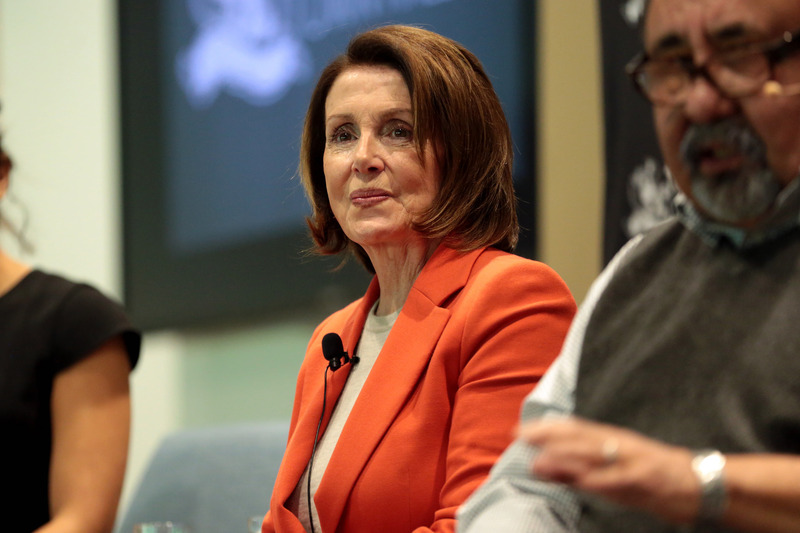 A photograph that went viral in political blogs appeared with commentary claiming that Democratic lawmaker and House Speaker Nancy D’Alesandro Pelosi was once a beauty queen; the future California lawmaker, so the rumor went, started out as Miss Lube Rack 1955. The photograph is real, but it does not show the young woman who would eventually become House Speaker, nor is it from 1955. It actually shows a model (who we have so far been unable to identify) posing at the Muller Brothers Oldsmobile Tires and Carwash in Los Angeles, California, taken in 1951 and published by LIFE magazine. It was one of many that appeared in a photo documentary about what was at the time the world’s largest automotive service station; the beauty contest was to celebrate the 3,000,000th vehicle to go through the car wash. Nancy Pelosi, who was born in 1940 in Baltimore, Maryland, would have been only 11 years old at that time. According to a 2012 article published by photographer and car enthusiast John Straub, the image is an artifact of Hollywood history showcasing the Muller family, which settled in Los Angeles in 1893. The family empire began with a fish market, which the family later sold so they could establish Hollywood’s first ice company. There was a day when gas stations actually tried anything they could to get men drivers to make the turn in for a fill up or car wash. It was certainly a different time, before Gloria Steinem came on the scene, and women started objecting to being used as props to attract customers. In 1951 the Muller Bros., an Oldsmobile-Firestone Tire-Car Wash-Cafe-Body Shop-Home Appliance-Auto Supply Dealer located at Sunset and Ivar in L.A., California named their complex “The Landing.” With good reason, they had everything you could want on one lot. It was giant compared to most new and used car dealers of the time, even had a control tower. They came up with the idea to hold a beauty contest to celebrate the 3,000,000th car to be pulled through its car wash. Life Magazine was there to photo-document the PR event for the rest of us to look back on. Obviously, all the girls, the winner of the beauty contest, and the car wash winning dude, look pretty happy. Hummm, which one would you vote for? The complex was located across the street from the Muller family home, and the area where the family once lived later became the site for the RCA building, then the home of the Los Angeles Film School. Today, the former site of the world’s largest service station is now home of another famous Hollywood landmark, the Cinerama Dome Theater. Early Views of Hollywood (1920 +). How a Cowboy Standoff Gave Hollywood’s Gower Gulch Its Name. 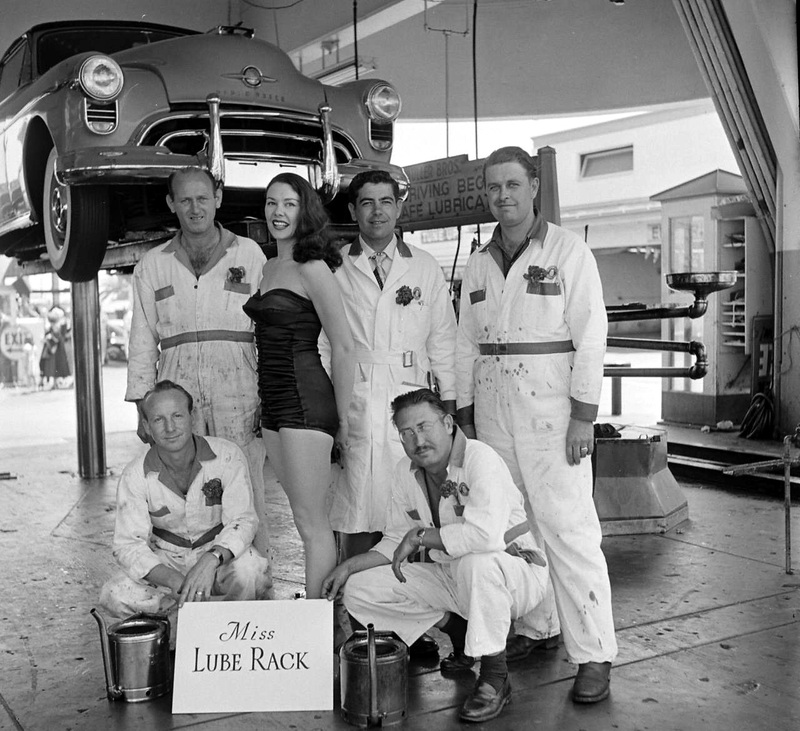 Nancy D’Alesandro Pelosi – Miss Lube Rack 1955. 2/11/2019, 2:59pm: Updated page with some links and sources; the original, which was posted on May 1, 2013, can be viewed here. Did United States President Donald Trump Threaten to Withhold Disaster Funding from California? Was the Thousand Oaks Shooter Identified as a Man of Middle Eastern Descent? Crosses Didn’t Burn in Southern California Wildfires?